Wouldn’t it be great to go shopping without having to fumble around for your near vision spectacles? How about when you go out on a rainy day and your spectacles need windscreen wipers, wouldn’t it be great to be glasses free for near and far? Say goodbye to the on-and-off hassle of single vision distance and reading glasses with DAILIES TOTAL 1 Multifocal contact lenses. 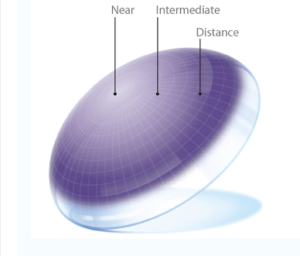 These lenses can help you see clearly from near to far. Anyone who needs spectacles for reading will understand the frustration of needing several pairs of spectacles. As time passes by we naturally need an extra boost for out near vision, this is as a result of the natural lens of our eyes becoming less flexible, a condition called presbyopia. Our contact lens optician Keith Williams has introduced Dailies Total 1 Multifocal into his contact lens portfolio, so that you can have the benefit of excellent comfort and vision at all distances, and minimise the frustrations of presbyopia. 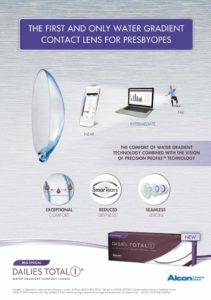 DAILIES TOTAL 1 Multifocal contact lenses are specifically designed to balance to the effects of presbyopia by using a unique precision profile designTM ensuring seamless vision up close, far-away, and everything in between. A great advantage with DAILIES TOTAL 1 Multifocal contact lenses is the water Gradient technology that aids comfort that lasts the whole day. This clever innovation by the manufacturers Alcon means that the core of DAILIES TOTAL 1 is highly oxygen permeable requiring few tears to keep it hydrated, and it slowly graduates to a very smooth outer surface that is moisture attracting so that your eye feels no lens at all. If you want exceptional comfort that lasts until the end of the day. 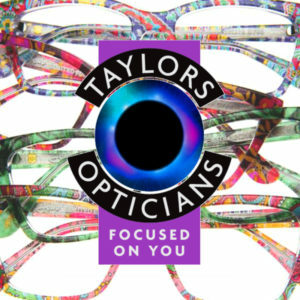 A highly breathable daily disposable contact lens for white, healthy-looking eyes with exceptional vision from near to far, then call into Taylor’s Opticians Frodsham for a free contact lens assessment with DAILIES TOTAL 1 Multifocal contact lenses.